Description: When was the last time you did something for the first time? 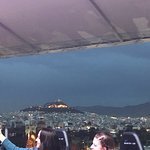 How far would you go to take the perfect selfie, watch the sunset under the Acropolis’ eye, have the time of your life with your friends or set your romantic dinner date above the city lights? 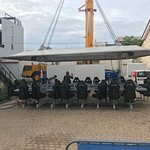 Launched in Brussels back in 2006, Dinner in the Sky, with a presence in more than 60 countries, started its operation in Athens in 2015. Since that time we have welcomed more than 16.000 guests from all over the world and have been rated as one of the Best Restaurants in Athens! 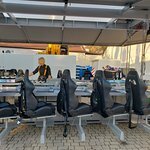 Dinner in the Sky is a multi-awarded extraordinary culinary proposal that welcomes 22 guests along with our Chefs who are preparing a 6 course menu lifts you up to 40 meters offering a once in a life time experience. 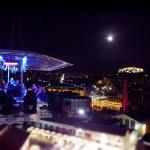 Dinner in the Sky takes you to heaven, while the nightlife of Athens “awakens”. 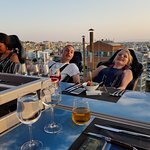 As the table slowly rotates you get views ranging from the sculpturally lit Acropolis, the surrounding mountains, the sea and of course the Athenian cityscape. 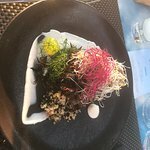 Amazing experience and great food! This was our first dinner on our honeymoon and it really set the bar for the rest of the trip. 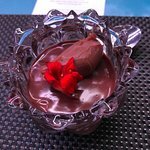 The staff was very friendly and made us feel comfortable and welcome, the chef even took photos of and with us! The food was also very delicious--and even better, they were very conscious of my good allergies (you can note it on the web site when you book a reservation) and had special dishes prepared for me which I more than appreciated. 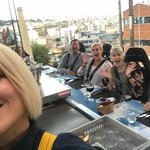 We did the sunset dinner which worked a little better with our schedule but I'm sure the later time is just as good because the views are amazing when at the top! 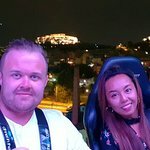 Since it was our first night in Athens, it was amazing to get such nice views of the city and the Acropolis, plus they played great music while we were eating. We also felt very safe strapped in to the seats and they do have lockers with keys where you can put your extra things before getting raised up. Just as a forewarning to visitors like us who didn't know the area at all, we did get a little lost finding it and the cab driver wasn't able to locate the exact location on his app so we ended up getting dropped off several blocks away and luckily got some help from people on the way. There wasn't a sign for it until we went through a gate into another square. Best way to find it is to look for the tall steel cylindrical structure with a crane behind it is my advice. This experience alone was totally worth the money! 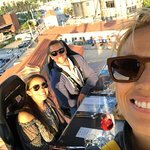 Thank you so much for your kind and warm review on your recent Dinner in the Sky experience while in Greece for your honeymoon! 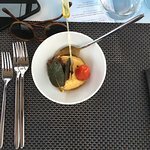 It is always a great pleasure to read that our guests are having such a great time with us while enjoying the 5 course menu and the views of Athens and most importantly feel safe the entire time. If you go to Athens, Greece, please don’t miss out on this experience of a lifetime! 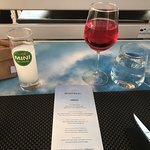 This was truly amazing from the atmosphere, food, and then the service! This is a premier attraction in the Athens area! 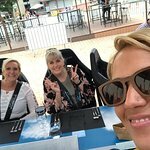 Thank you very much for taking the time to post a review on your Dinner in the Sky experience. It is such a great pleasure to read that you had an experience of a lifetime with us and enjoyed the atmosphere, the menu and the service extended by our team! 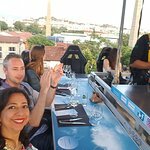 Thank very much for taking the time to post a review on your Dinner in the Sky experience. It is very important for us that our guests feel safe while enjoying the experience and we are very pleased to read that you and your family felt this way. Most amazing experience of our trip! I am not able to put enough adjectives in this review to even express how wonderful this dinner was! Amazing, fabulous, delicious, wonderful are just a few that start to describe! Yes I am afraid of heights and I didn’t for 1 second get scared! The staff is off the charts awesome! Magda the chef is one of the most talented chefs I have had the pleasure of enjoying! Stathis is most wonderful host and not to mention incredibly handsome! The only complaint I have is it ended too soon!! I would want to be there for at least 3 hours! I would pay double for this experience! Food and drink is superb! 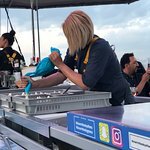 Thank you so much for your kind and warm review on your Dinner in the Sky experience as well as your compliments for our team! It is always a great pleasure to read that our guests who have a fear of heights decide to join us and have at the end an amazing experience with us. Athens from above - yes please! 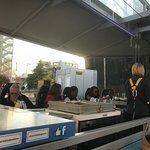 Me and my colleagues had dinner in this restaurant. It was remarkable experience. To be honest, it’s primarily not for the food that you go to this restaurant. 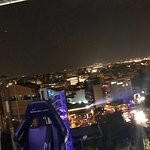 Not that it’s bad, it’s actually quite ok. It’s for the experience of being winched 60 meters up in the air having a magic view of Athens while having dinner. 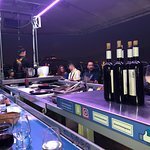 And enjoying the good atmosphere that builds up when combining the ingredients of 20 people up in the air with nowhere to go, some good music, plenty of wine and food. The staff was great and really contributed to the experience. I can highly recommend this for a family event, corporate team-building, or to anyone that are up for some fun. It’s a bit pricey but absolutely worth every penny. 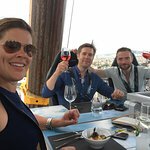 Thank you very much for visiting Dinner in the Sky with your colleagues and pleased to read that you had a remarkable experience with us! 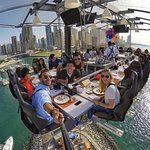 Been to Dinner in the Sky? Share your experiences!